I just wanted to dop in a quick post to wish you all a Merry Christmas and all the best for the New Year. Thanks for all you comments, support and Love in 2009! Roll on 2010 for another year of car builds, shows, meets, skids, wheels, stance and loud exhausts! Now, time to unwrap some more pressies! 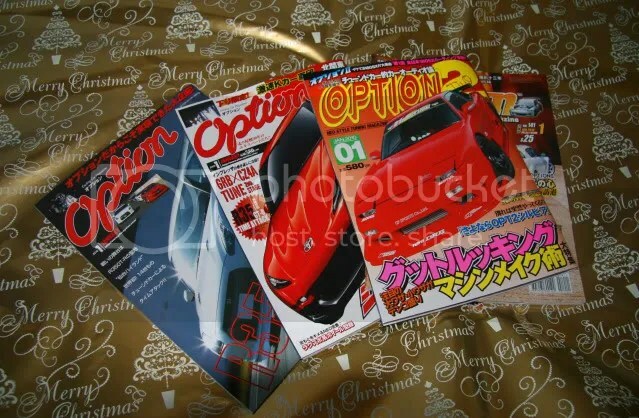 Massive thanks to my friend Claudio for bringing me back some Option mags from his recent trip to Japan!!! I’ll show you some more of these soon! Hey there! I have a totally offtopic question if you don’t mind: How much does insurance cost you for one year with this great car? Thabks!